Local table tennis paralympian celebrity, Jack Hunter-Spivey, cuts the ribbon at the Starbucks drive through opening in Sheffield. Starbucks’ first UK franchisee, the Southampton-based company 23.5 Degrees, has opened its 60th Starbucks outlet. 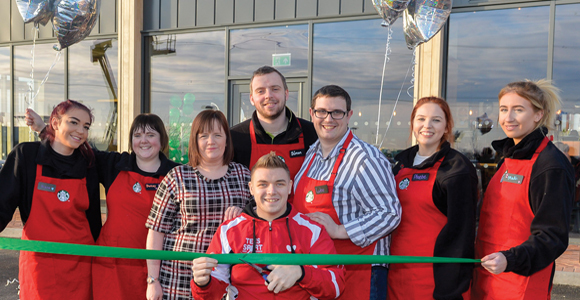 The new store in Sheffield, South Yorkshire has created 20 jobs for the local community, including 23.5 Degrees’ first apprentice. 23.5 Degrees opened its first Starbucks in Liphook, Hampshire, in February 2013. Last year it opened 20 stores and currently has six further new outlets in the pipeline, with a target of 23 stores planned this year. After opening 13 drive through stores in 2018, the company says it is actively seeking further drive through opportunities on main arterial routes, close to major retail destinations or on large industrial estates, in addition to prominent high street locations. 23.5 Degrees adds that it has invested more than £20.5m in the UK economy to date through building and buying stores and has over 770 employees, with nearly 70 per cent of current managers and area managers having started as baristas with the company.